Dr. Gururaj “Desh” Deshpande, the founder and Chairman of Sycamore Networks is an influential technology entrepreneur and a visionary whose companies and ideas often reshape entire industries. After attaining superstar status in the world of entrepreneurship, Desh, along with his wife Jaishree has turned his attention to philanthropy and social entrepreneurship to help both US and India. In addition to Sycamore, Desh is also involved in six other companies including Tejas, Airvana, A123 Systems, HiveFire, Webdialogs and Sandstone Capital. On the nonprofit side Desh is on the Board of MIT, IIT-Madras Trust, TIE Board, TIE Foundation, Chinmaya Mission, Deshpande Foundation Sandbox, Akshaya Patra and the Public Health Foundation of India. Jaishree works with Desh on nonprofits and is also a Trustee of the Museum of Science and is supportive of their efforts. 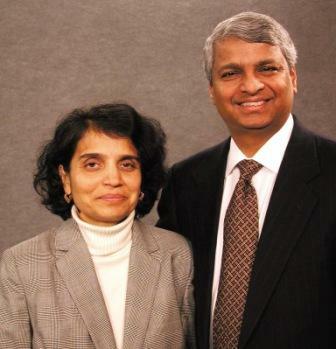 Deshpandes’ generous donation has made possible MIT's Deshpande Center for Technological Innovation. The Deshpande Center was created to serve as a catalyst for innovation and entrepreneurship by supporting collaboration among entrepreneurs, young companies, MIT students, alumni and faculty. In India the Deshpande foundation has created a social entrepreneurship sandbox which incubates NGOs that have the potential to create a large impact. Akshaya Patra is one of the first experiments that is well on its way to becoming a success story. Dr. Deshpande holds a B. Tech. in Electrical Engineering from IIT Madras, an M.E. in Electrical Engineering from the University of New Brunswick in Canada, and a Ph.D. in Data Communications from Queens University in Canada. Jaishree Deshpande earned her MSc in Physics from IIT Madras and holds an M.S. in Computer Science from Boston University. In this interview with Lokvani, Jaishree and Desh share their exciting journey and talk about their philanthropic work in India and the US. What were the key factors responsible for your phenomenal success as an entrepreneur? Desh: I have been fortunate to be surrounded by good people in every initiative that I have undertaken. That has been the most important key to success. I strongly believe in constantly learning from my experience and feel a great need to constantly re-invent myself. I believe that these two factors have been critical to success. While you were growing up was it your goal to become a successful entrepreneur? As a young man did you ever imagine that you will be in the position that you are in today? Desh: It is not my nature to have grand goals. I always plan for about three to five years at a time. I have taken time in between these periods to rethink about my life and goals. These periods of reflection have been extremely useful to re-energize me to get to the next step. Often in life we get so wrapped up in the everyday routine that without time for reflection we can get lost in gathering micro-information and lose track of the big picture. For me the pleasure has been in the journey. Whatever I do I always make sure that I have fun doing it. Dreaming about your next destination is a lot of fun. Jaishree, while Desh was having a very busy career you, an IIT graduate, decided to quit your job and decided to stay home. Was that a difficult choice? Do you regret it? Jaishree: It is always a difficult choice for any mother. Earlier when I used to see my friends who have pursued the career path I would feel a little twinge. As time progressed it became easier and I made peace with my choice. I have never regretted it. I have thoroughly enjoyed raising my children. Looking back it was absolutely the right thing to do. If I were to do it again, I would do the same except that I would not twinge. After our two boys went to University, I have regained my freedom. I now enjoy working on philanthropy and traveling. I was fortunate that Mahesh Ganmukhi and his daughter Swati introduced me to trekking in the mountains. I enjoyed my trek to the Everest Base Camp with them. It was one of the most challenging experiences for me and it broadened my comfort zone. Last year I was also lucky to have the opportunity to trek to Mount Kailas. Could you describe your journey into philanthropy? Desh: Cascade went public in 1994. At that time, Jaishree and I started thinking about how we can have a bigger impact given the new resources we had at our disposal. We formed the Deshpande foundation. Our first gift was to IIT Madras. We felt that IITians have been so successful that if we formed an alumni network, IITs would benefit in the long term similar to the way that Harvard and MIT benefit from their Alumni network. Our first big gift was a quarter million dollars that we donated to IIT Madras to establish an IIT Alumni Network. We have given several more millions to IIT since then. It is very heart warming to see that IITians now come together in thousands and not only share their own life experiences, but also give back to IITs. After Sycamore went public we donated $20M to MIT to set up the “Deshpande Center for Technological Innovation”. We also funded MIT’s Undergraduate Practice Opportunities Program (UPOP). We gave the initial capital required to build the Chinmaya Mission in Andover. We have established a Social Entrepreneurship Sandbox in India to incubate good ideas and refine them so that they can be replicated and have a large impact on the most marginalized population. We are also the founding donors of Public Health Foundation of India (PHFI) along with Bill Gates and other donors. PHFI is setting up 7 IIPH (Indian Institute of Public Health) to train 10,000 Public Health Professionals every year. The Deshpande center has a strong focus on innovation. Could you describe its mission and philosophy? Desh: As we see the economies of India and China moving forward it is clear that the strength of the US lies in innovation. In the US, we spend over 100 billion dollars in research. Lot of innovative ideas that get generated in the process get shelved for they do not find the right market and in the process they get lost. MIT has been at the center of the innovation process. MIT has a long tradition of nurturing innovation, providing the technology for new companies, and of building successful relationships with larger corporations that fund research. But historically, obstacles remained in the innovation process, between initial concepts and commercialization. Unproven ideas had little opportunity to advance beyond their theoretical stages, and younger companies lacked ways to discover and fund new ideas. We established the center to solve this problem. We created the Deshpande Center to connect MIT’s innovators with the marketplace. Through the grants program we provide funds for research for faculty and students. We have a catalyst program where we choose entrepreneurs to serve as catalysts that can help bring the research idea to market. We have the I-teams program which is a unique opportunity for students to develop Go-To-Market strategies for MIT Technologies. We also have an IdeaStream symposium which gathers together the leading minds in innovation and entrepreneurship for an invitation only event each spring. We have had several successful companies that have emerged from the center. Brontes technology is an example of such a company whose founders had excellent patented technologies in 3D imaging. Through the Deshpande center programs they realized that their technology had a major application in dental imaging, a market that they would have never considered previously. Today they are leaders in dental imaging and have been acquired by 3M. You have a unique approach to social entrepreneurship in India. Could you describe the mission of the “Social Entrepreneurial Sandbox” in India? Jaishree: India has an excellent tradition of individuals taking the initiative and setting up NGOs to help others. In fact, there are over a million NGOs in India. However, the NGO sector in India is fractured and we need to create a more systematic approach to scale the good ideas. In the for-profit world, the companies invest in product development, perfect the product and then mass produce it for consumption. However, in the non-profit world, people start with noble intentions and a very good heart. However, they are always under resourced and their ideas don’t get an opportunity to become real. We are setting up the “Social Entrepreneurship Sandbox” to experiment with the ideas and give NGOs the opportunity to prove and refine their ideas. The “Sandox” is based in Hubli, Karnataka and covers approximately 8 million people living in a couple of small cities and hundreds of villages. It is an area large enough to represent different types of problems that exist in India. We invite NGOs to apply for grants to the Deshpande Foundation to bring their programs to the Sandbox. This year we are supporting about 50 programs. Nishith Acharya, Executive Director of the Deshpande Foundation, champions these programs and is based in Boston. Naveen Jha, who recently completed Masters in Sustainable International Development from Brandeis, is moving to Hubli to lead the effort. The value we provide to the NGOs in the Sandbox, in addition to money, is that we are developing a community that will set the bench marks for the best practices in the NGO sector. There are several fellows from USA who will go and spend a year or two in the Sandbox. We have one fellow who started her work a year ago. She has been an excellent change agent and is having an enormous impact in the area. Our hope is that if we support this initiative for 5 to 10 years, the Sandbox will become a hot bed of Social Entrepreneurship, just like Boston and Silicon Valley are for High Tech Entrepreneurship. We have been lucky that we have had some initial success with a program called Akshaya Patra. The Akshaya Patra Foundation provides mid-day lunch to school going kids. They have developed a process where they can build a kitchen for approximately a million dollars and serve a hot meal to over 100,000 kids from the centralized kitchen. We funded the kitchen in the sandbox. They have now perfected the process and their supply chain. They have quickly scaled the organization to feed 570,000 hygienic and nutritious meals to underprivileged school children everyday across ten locations in India which is an enormous undertaking. The Akshaya Patra Foundation functions on a model of public-private partnership where the Central Government, State Governments and companies have come together with Akshaya Patra to support the program. Akshaya Patra (http://www.akshayapatra.org/) has the ambition of scaling the program to feed a million kids everyday by 2010. We felt that this is such an impactful, efficient and appealing program that several people in USA would like to get involved with this program. Therefore, the Deshpande Foundation set up the Akshaya Patra, USA in Boston and is housed in the same office as our foundation. Shikha Bhatnagar is the Executive Director of the Akshaya Patra, USA and can be reached at shikha@akshayapatrausa.org. We are hoping that all your readers will get involved and support this program. For a donation of $28, the organization can provide hot nutritious meal to a kid for the entire academic year. We are also very pleased that the US Congress recognizes the efforts of Akshaya Patra as one of the best and the largest efforts in the world to beat hunger. We are very pleased that the US Congress has granted a US Congressional fellowship to this organization. How do the two of you divide the responsibilities of managing so many companies and non-profits? Desh: The key is to hire good people. The Executive Director of the Deshpande Center - Leon Sandler, Executive Director of Deshpande Foundation - Nishith Acharya and the Executive Director of Akshaya Patra Foundation – Shikha Bhatnagar are all very good at what they do. I look after the for-profit companies. I am fortunate to have excellent CEOs and founding teams that are world class. It is a lot of fun working with them. Jaishree manages the non-profit initiatives. She is very instrumental in working with the Sandbox concept and leading our philanthropic efforts in India. Do you provide opportunities for NRIs to work with the “Sandbox” initiatives? Jaishree: There are 2 million Indians in USA. Some of them can afford to donate a dollar and some can donate millions. Some of the NRIs can spend a few hours a year and others can spend full time helping the marginalized people in India. We are hoping that we can create platforms like Akshaya Patra where any one can get involved to whatever extent they can and it all adds up to helping the needy. What advice do you have for youngsters aspiring to climb the success ladders? Desh: It is important to find things you are passionate about and to do things that you want to do rather than doing things that the world expects you to do. Enjoy the process of doing things rather than waiting to get to your goal before enjoying life. There is no substitute to hard work and disciplined life. However, I have found that hard work comes naturally with passion. I would encourage everyone to live a simple life; don’t complicate your life. Simplicity frees up resources both in terms of time and money to do things that you really want to do. Jaishree, you are the mother of two children. Both are MIT graduates with good values. What is the secret to that success? Jaishree: Raising kids with simplicity. We all have resources and have an urge to give the kids everything even before they need it. This leads to entitlement and lack of gratitude for what they have. Having the discipline to let the kids struggle to get what they want is important. This is a good way to help them find their passion.